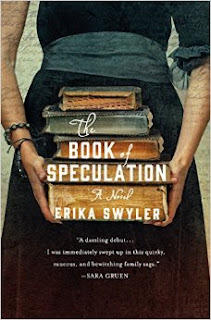 I was hoping that The Book of Speculation by Erika Swyler would be something special but, sadly, I found that it fell short in the details -- starting with the cover that is so strangely photoshopped. I feel like the impossible stack of books with two that should be different but aren't should have clued me in that this book was going to be slightly off. There are a lot of people who loved it and found it magical. I, however, was too distracted by impossible dates, improbable coincidences, and undefined magic to fall under its spell. This is a dual narrative book, moving back and forth between the present and the late 1700s. The two are connected by a book, a journal that was kept by Peabody, the owner of a traveling show. The book ends up in the modern-day hands of Simon, an orphan with a home on the northern coast of New York's Long Island, a house that is in imminent danger of falling off a cliff. The house is symbolic of Simon's life as he's about to lose his job and his whole sense of reality. The truths that are held in the book--the facts about people that may be Simon's ancestors--are not easy to deal with but do explain some of the things he knows/fears about his own family. I really did want to love this story but I found myself getting stressed and/or annoyed far too often. From the spoken and internal dialogues that were written in a confusing way to the impossibility of the timeline based even on generous generational spreads, I had to fight through the rough stuff to see the glimpses of good. I love magical realism but this one had very little rhyme or reason to the magic. Last night was the worst though when I started complaining about plot details to the husband and it perfectly mirrored what was annoying us about the season 4 episodes of Gilmore Girls that we had just watched. It was off-putting and made this original tale seem a bit predictable. I know I tend to be overly critical of RIP reads. I save some of them for months and months and I can only read so many of them and so I put pressure on the poor books to be stellar. Some will only be perfectly fine, which would be okay at other time of the year. This one was indeed fine -- but not for me, not right now. I kept missing where the quotes ended and I thought the guy was actually speaking to people like a mature person. Instead, it seemed like almost all of his dialogue was in his head. Frustrating for sure. Since I don't get out of my cave often enough, I hadn't even heard of this book before. But I'm guessing from the things you said about it, that it honestly would not have been a winner for you no matter what the time of year. I really used to hate it when I just didn't like a book that others loved, or vice versa, but I've come to really appreciate that we all can have such varied reading experiences with the same book. True. And I always feel guilty about writing a non-praising post but I think we all need to remember just what you said: that every book doesn't necessarily work for every reader. When I write a post like this, it probably helps me later when I read a critical post of a book I loved. Complete agreement on this one. At first the magical aspects worked for me, but then they just kept coming and so did more characters and plot twists and houses falling into the ocean...and what?! I thought it was good-ish, but not great. Oh good! So many people loved this one that I felt like I missed something.